Many years ago I had my a roommate introduce me to this cake. I thought it was absolutely divine, but later I lost the recipe. Then the other day I spotted it HERE on the Mother Huddle. I was thrilled. It was the long lost cake recipe! Hallelujah! I decided to make it for my dad's birthday last week. It was a crowd pleaser. I wish I could give you a slice. I guess a virtual slice will have to do. I feel like this post needs another picture, but I figured you probably didn't want to see one of me laying on the couch with the top button of my pants undone because I ate too much cake. Not pretty :) If you want to try the recipe you'll find it HERE. Thanks for sharing it with us Maria! Wow! I haven't even thought about that cake in years! I found it 30 yrs. ago when I was first married in Joy of Cooking, love it & made it often. Maybe it's time to make it again. 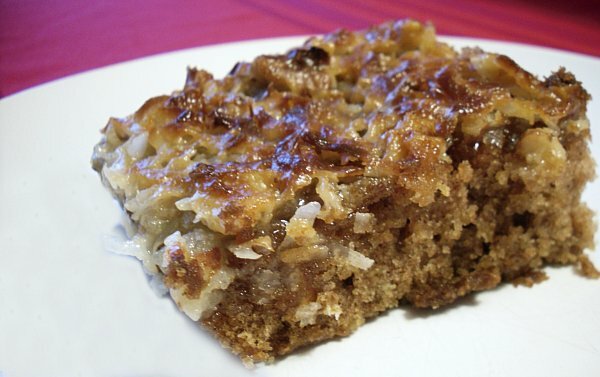 this is sometimes called amish breakfast cake! i love cake for breakfast! This looks like one of my favorite cakes. We call it O' Boy Oatmeal cake. Now I'm craving it. Mmm yum! I make a really similar cake but with sunflower seeds instead of oatmeal. One of my mom's friends gave her the recipe in the 70s, "Sunny Oatmeal Cake". Love it! I made it a few months ago and one of my dogs decided that she loved it to and ate about a third of it. Thats what I get for leaving it too close to the edge of the counter! It looks delicious!! I am just making it right now for my husband's best friend's birthday, I will have to let you know later how it tasted. Maybe I will post a pic. thank you for sharing something easy today when I needed it the most! I am drooling!! This is the perfect weekend for cake making (what day isn't though ;). Thanks for sharing! Um...Wow. So I saw this the other day and thought I needed to find a reason to make it. I was in charge of a desert for my recipe group with my friends and can I just say AMAZING! It was gobbled up and I am going to start making it weekly (or daily...) thanks for sharing!